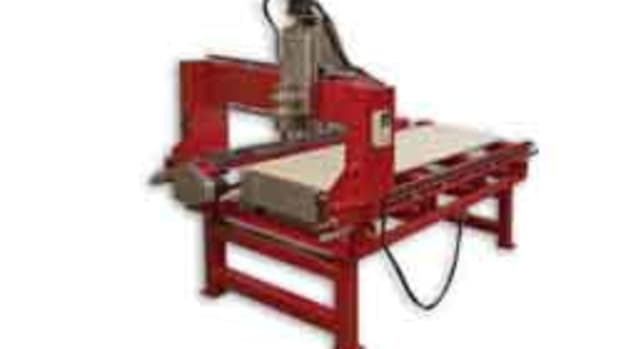 Most woodworking shops with a 3-axis routers are setup to cut cabinet and furniture parts from flat panels and solid wood. But what happens when a customer walks through the door with a relatively complex part and wants it replicated as precisely as possible. In some cases, though it might be time consuming, the part can be measured and drawn with CAD software. It gets more complicated if the part is carved or has contours. A rational shop owner would pass on the job unless he was familiar with digital probing, laser probing or laser scanning. Laser probing and laser scanning are not for most typical cabinet or furniture making shops. These are tools used by large manufacturing firms to replicate parts or to do quality control. There are also companies that will laser scan oddly shaped parts and then convert the output from that scan into a file format (DXF, STL or the like), that can then be used in a shop’s CAM program. These are known as “solid scans” as they represent the scanned object as a solid object when the scanning is done. Digital probing is a more practical solution. The probe is basically a type of switch that has a long tip on it that generates a map of heights on the Z-axis over a gird on the X- and Y-axis plane. The resulting map of heights is known as a “point cloud” where each point has an X, Y and Z coordinate. The results of a probe scan are known as “surface scan” as the tip of the probe only touches the external surface of the object. The point cloud is generated when the tip of the probe makes contact with the object and activates the switch in the probe body. The switch generates a signal that is sent to the CNC controller point-by-point. This set of points is saved to a user designated file in the storage medium chosen by the user which is either on the CNC controller or on a computer that is used for the platform for the CNC controller. On the probe tool is the probing tip. Probing tips, more technically know as a stylus, are the part of the digital probe tool that makes contact with the object being scanned. Tips used in the woodworking industries are generally not complex, looking mostly like a small metal shaft with a ruby tip. The shaft must be of a very rigid material, and the tip must be accurately spherical. The ruby tips can be of any diameter, though the smaller the diameter, the more accurately the point cloud will represent the actual object. However, small probes take longer to scan an object. Another time factor is the distance between the points on the X-Y plane grid, which is determined during the probing processes setup. The smaller the distance between these points on the X-Y plane grid, the more accurately the probe scan will represent the original object. In most cases, a successful probe scan process will take 12 to 18 hours. A point cloud cannot be used to immediately generate tool paths and G-code. It has to be converted into a type of file that can be further processed into a format that can be exported to a CAD program. These conversion programs do what is known as “surface reconstruction” where the set of points, which can number in the tens to hundreds of thousand, is converted to a DXF or SLT file which most CAD programs can read. Some software program have the capability to read and display the surface file, though more often than not the refinement phase needs an add-in for the CAD program. Add-ins offer a variety of methods to execute the refinement, with some of the refinement being automatic based on user set parameters, while more detailed refinement must be done manually. The refinement step of the process is very detail oriented and therefore quite time consuming. After refinement, the point cloud is exported in a chosen file format (DXF or STL, for example), and then the CAD model can be refined further to add items like small details that were too small for the probe tip to register. Some details are either too time consuming to add to a CAD model or impossible to machine, so it might be more productive to use hand tools. The next step is to begin machining. Use a small ball nose bit and machine at a slow speed to produce the greatest detail. How do you get digital probing technology? First, call the manufacturer of your CNC router and/or controller to determine capability. If affirmative, ask about probe tools, software and the like. If not, the task becomes a bit more complicated though not impossible. 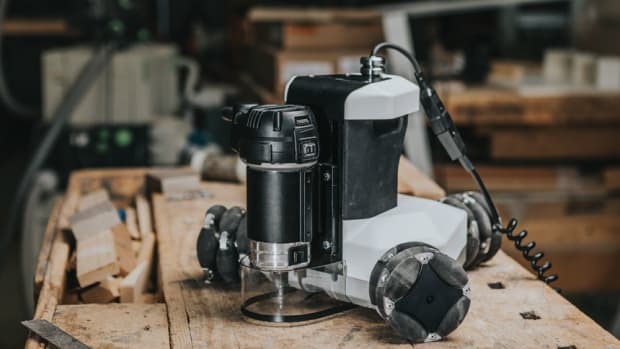 Since all CNC routers have limit and home switches, there is often a way to tap into the controller circuitry and use it for the digital probing process. Your best source for this information is an online forum.